The fishing has been good overall for both boat and shore anglers. 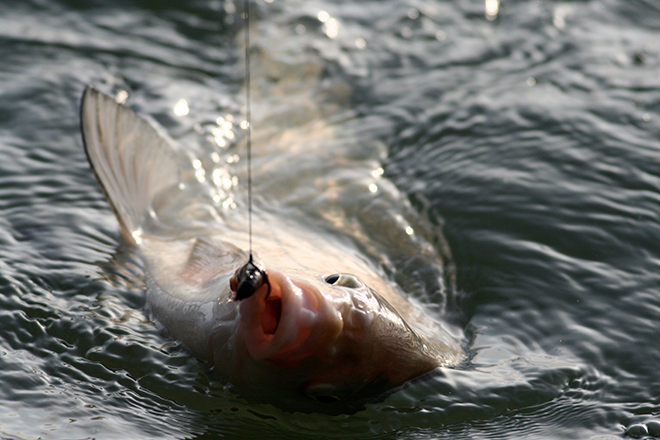 The crappie bite has been hit or miss, but boat anglers are having luck fishing the deeper water, while shore anglers are having minimal success. Anglers are catching plenty of saugeye from both boat and shore. The carp are very active this time of year and anglers are having no issues catching their fair share of carp from shore. Some anglers have reported catching some small numbers of largemouth bass and channel catfish. The island is currently closed due to some maintenance work. The river has seen steadily increasing flows out of Lake Pueblo. Currently, the river is running at 710 cfs. Despite the higher flows, anglers are still catching fish in the river. Spin and fly anglers are both reporting success. Spin anglers are doing well on spinners and fly anglers are still having luck on midge, caddis, blue wing olive patterns, as well as streamers. The fishing is steady with anglers regularly catching smaller white bass, a few crappie, the occasional walleye, drum, and catfish. The water is still rising at a high rate due to runoff and recent storms. As of Sunday evening, the reservoir was at 247,000 acre feet. The current surface temperature is around 55 degrees. Fishing on the lake has been fair to good as of recently. Anglers are consistently catching walleye on jerk baits, crank baits, and jigs. Bass fishing is also pretty good right now. Soft plastics and crank baits are consistent producers for anglers pursuing bass. The trout fishing has been fair for those using bait from shore. There have been no reports on catfish at this time. Wipers have been far and few between. Anticline Pond has been producing a lot of trout. The catfish are starting to bite with anglers catching several fish around 10 pounds. Fishing for catfish is currently best at night and anglers are having luck using legal fish baits and liver. The bass and crappie bite is picking up, with anglers having luck using various colored jigs and hard baits. The trout fishing is slowing down due to the high daytime temperatures. The lake is currently at 992 surface acres. Fishing from the south shore has been very good. Anglers are catching fish around the lake using worms and PowerBait. Reilly Canyon, where the river comes into the lake has been very hot with plenty of walleye and trout being caught. Yellow perch in the 10 to 14 inch range are being caught around the lake from shore and from boats. Boaters have been catching mostly trout and walleye. Jigs tipped with worms has been the most effective way to catch fish. The bass fishing has been good on all the ponds for anglers using the same tactics as what is being used on the reservoir. Focus on using soft plastics and crank baits. Jigs are also working well.